Commit2clean offer end of lease cleaning Brunswick for residential and commercial properties as well as carpet cleaning. If you have ever rented a property you must know how strict landlords are when it comes to end of lease cleaning. They require seeing a perfectly clean place in order to give back your deposit. Some landlords allow their tenants to clean themselves however, recently landlords started to include in the lease contracts that the property has to be professionally cleaned and a cleaning certificate has to be obtained. 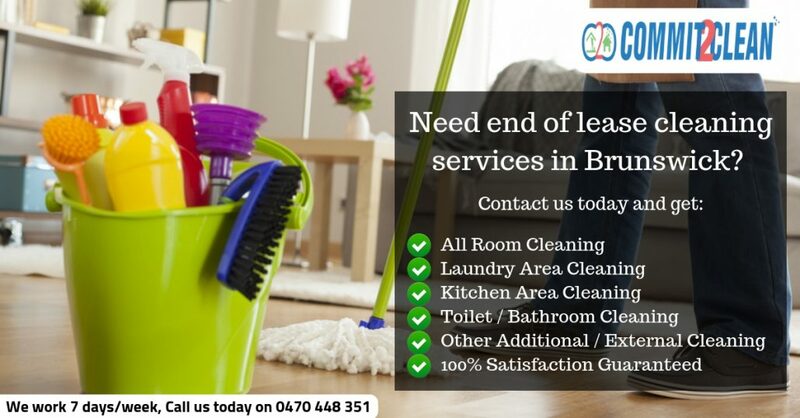 Get Best End of lease cleaning Brunswich, We guarantee customer satisfaction! Commit2clean cleaning services are aware of these requirements and we have a checklist that we follow to make sure that no area in the property is missed and once we are done, we issue the cleaning certificate.We guarantee customer satisfaction with our services and if there is an issue with our cleaning, we will come back and clean again. Our teams are trained and professional and always aim to deliver the best results in your home. We are also offer carpet and move out cleaning for all the individuals that want a same day cleaning service. Our cleaning equipment is of highest quality and all products we clean with are environment friendly and safe for people’s health. Our working hours are flexible and we aim to fit into your schedule.We work 7 days a week and our customer friendly phone service is available to you at all times. simply give us a call on 0470 448 351 and we will be more than happy to answer your questions.